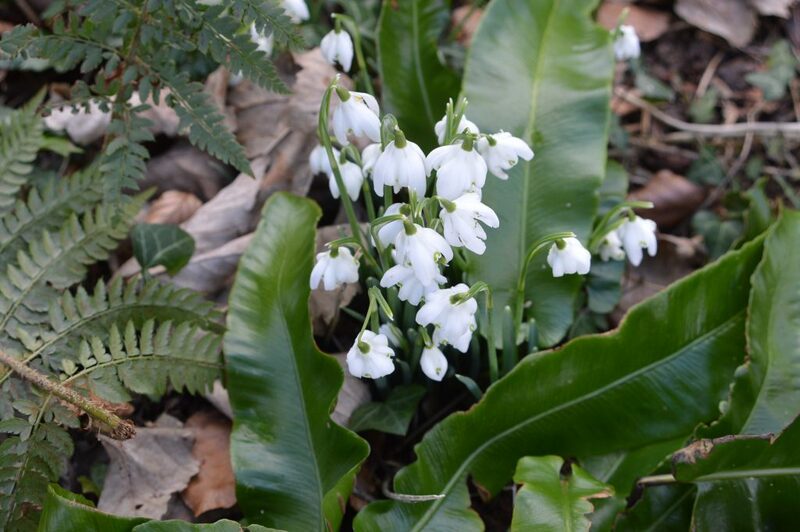 There are signs of spring in Shirwell, with the first flowers of the year starting to peek above the ground. Now that we’ve got through the New Year, the snow drops have started to grow and the woodland at the bottom of the garden looks a treat. With the branches of the trees above, their trunks clad in soft green moss, the floor in bloom, and the moor stretching off into the distance, the garden is one of the most peaceful places to be this time of year. Inside The Spinney itself, everything is at a level of cosy that almost makes you forget about the temperature outside. The Rayburn chugs away in the kitchen and there are two woodburning stoves, one in the living room and one in the Snug, so the whole house is at just the right temperature you want when there’s a cold snap outside. To make The Snug live up to its name even more, there are now works from local artists in it and the conservatory, so you can really get a feel for this part of Devon while you sit around the fire enjoying a well-earned cup of tea or having breakfast. I’ll talk more about these more in another post and include a few pictures! Safe to say, they are really brightening up the place, and every piece is for sale so you can take a little bit of The Spinney back home with you. The Spinney is open for Valentine’s Day bookings, so if you haven’t sorted something out for your S.O. just yet, there’s a small nook in North Devon awaiting both of you. Along with the fantastic scenery and the comfy rooms, Shirwell is a wonderful location for finding little restaurants and pubs tucked away from the rest of the world. So for a Valentine’s weekend that neither of you will forget, The Spinney is just a phone call away! Along with the snow drops’ newfound vigour, The Spinney’s new resident beast, Bodge the cat/installation has finally started venturing outside for about 10 minutes a day. Whether the short amounts of time he’s been venturing out is due to his Christmas weight or not remains to be seen. My personal theory is that it’s because being from Cambridge, he’s never seen a hill before so can’t quite deal with the idea of the ground having texture. I’ll keep you updated with goings on at The Spinney, the art and (of course) the cat’s adventures in future posts. Until next time, good bye!